This chapter is a synthesis of new knowledge, procedures, best practices and references for collecting plant diversity since the publication of the 1995 volume Collecting Plant Genetic Diversity: Technical Guidelines, edited by Luigi Guarino, V. Ramanatha Rao and Robert Reid, and published by CAB International on behalf of the International Plant Genetic Resources Institute (IPGRI) (now Bioversity International), the Food and Agriculture Organization of the United Nations (FAO), the World Conservation Union (IUCN) and the United Nations Environment Programme (UNEP). The original text for Chapter 25: Collecting Pollen for Genetic Resources Conservation, authored by F. A. Hoekstra, has been made available online courtesy of CABI. The 2011 update of the Technical Guidelines, edited by L. Guarino, V. Ramanatha Rao and E. Goldberg, has been made available courtesy of Bioversity International. Germinating pecan pollen. (Photo: J. Waddell/USDA-ARS – National Center for Genetic Resources Preservation). Pollen is a useful source of diverse alleles within a genepool and so may be an effective propagule for genebanks. The ease of pollen storage and shipment and the potential for its immediate use provide researchers with increased options when designing their breeding programs. Methods for pollen collection, desiccation, viability testing and longevity assessment have been developed for many species of interest, and have revealed the critical importance for increased longevity by using high quality pollen desiccating it sufficiently in a rapid manner and subsequently storing it at very low temperatures. Reliable viability assessments are dependent upon adequate rehydration and the use of reliable stains, in vitro germination assays or in vivo pollination experiments. Pollen preservation in genebanks will likely be implemented as standard procedures for handling and assessing it are developed. Genebanked pollen can be made available to breeders upon request. For tree species, this obviates the need for growing the male parents in the breeding orchards. It allows for wide hybridization across seasonal and geographical limitations, and reduces the coordination required to synchronize flowering and pollen availability for use in crosses (Bajaj 1987). With adequate pollen available, one can also load additional pollen onto stigmas to increase pollination and yield. Pollen is available for research programs. As single cells, pollen provides a simple model system for research on conservation. Storage of pollen within genebanks also ensures its availability year-round for basic biology and allergy research programs (Shivanna 2003). Pollen captures diversity within small sample sizes, and documentation is available for long-term survival of pollen from many diverse species (table 25.1). Pollen also serves as a source of genetic diversity in collections where it is hard to maintain diversity with seeds (species of low fecundity, large seeds, or seeds that require an investment of labour to store). Pollen can also be shipped internationally, often without threat of disease transfer (Hoekstra 1995). Limited pollen production in some species. The primary limitation in the routine implementation of pollen storage within genebanks is the difficulty in obtaining adequate quantities of pollen for many species. Labour-intensive collection or processing. For some species, pollen is readily available, but resources to accumulate and process enough pollen for routine storage and distribution are inadequate. No standardized processing or viability-testing protocols. Processing and viability-testing methods have not been documented and standardized in a manner similar to that of seed testing. Regeneration of aged pollen. Seed regeneration can often be performed directly using the seed samples in storage. For pollen, associated mother plants are necessary to replenish pollen supplies when quantities are depleted or have deteriorated (Schoenike and Bey 1981). Collected pollen serves to maintain and preserve the alleles of an individual or population. Sampling strategies have often recommended collecting a set number of individuals per population to ensure that the common alleles are captured. The exact number of individuals that most effectively captures the genetic variation is dependent upon the genetic diversity and life-history traits of the species (Lockwood et al. 2006). Namkoong (1981) suggests that collecting pollen from a single tree easily captures the alleles for that genotype; however, it is recommended that a minimum of 68 trees be sampled to represent a wild population. Pollen can also be collected from individual trees within a genebank both to conserve alleles specific to each individual and to provide male gametes for breeding purposes. Although only small quantities of pollen are required to capture the genes of an individual, because of the challenges of pollen collection and processing, it might be more efficient to collect larger quantities to ensure its long-term availability to the user community. Pollen should be harvested soon after anthesis, usually in the morning hours (Ganeshan et al. 2008; Towill 2004). Shelf life is short for pollen collected from immature, aged, or weather-damaged anthers (Towill 1985). It is usually more practical to collect anthers in the field and then separate the pollen grains from the anthers in a laboratory environment soon after collection. All pollen must be processed immediately (within hours) to ensure maximum potential longevity. (photo: John Waddell, USDA-ARS-National Center for Genetic Resources Preservation). Successful pollen genebanking is dependent upon achieving long-term survival of stored pollen. Water content, cooling rate and storage temperature all affect the longevity of stored pollen (Buitink et al. 1996, 2000). Field conditions and relative humidity at the time of harvest affect the pollen moisture content, and germinability is impaired when pollen is kept for any length of time in wet or high-humidity conditions (Hoekstra 1986). Pollen ages quickly when held at 24°C and 75% relative humidity (RH) (Van Bilsen et al. 1994). For desiccation-tolerant pollen, it is critical that the pollen be dried to a target moisture content soon after harvest. Depending on species, successful long-term storage requires that the moisture content be reduced to or below levels at which there is no free water (Priestley 1986). For many species, pollen can be dried to water contents of 0.05 g H2O g-1 dry weight (DW) without a loss in viability (Hoekstra 1986). This can be achieved by drying overnight in a low-humidity room environment or over salt chambers that are maintained at RH of about 30%. Equilibration over salt slurries, such as magnesium chloride or calcium nitrate, prevents damage that could result from over drying within ovens. It is a straightforward method to control moisture content in diverse laboratory environments (Connor and Towill 1993; Towill 1985). Anthers or pollen grains can also be dried over silica gel at room temperature (Ganeshan 1985; Parfitt and Ganeshan 1989; Parton et al. 1998; Sacks and St. Clair 1996; Van der Walt and Littlejohn 1996). Martinez-Gómez et al. (2002) successfully desiccated almond pollen with silica gel for 48 hours at 22°C for long-term storage. Sato et al. (1998) dehydrated anthers at 20°C for 16–24 hours at RH of 15% or 32% prior to storage. Although some researchers have demonstrated successful desiccation through the use of freeze-driers for pollen desiccation, concerns have arisen with regard to maintaining viability in pollen that has been frozen prior to dehydration (Ganeshan and Alexander 1986, 1987; Perveen and Khan 2008). Towill (1985) argued that vacuum drying was as effective as freeze-drying for maintaining pollen viability. Although air at low RH will increase the drying rate, pollen must be removed before it dries to a lethal moisture level (1% to 2 % for peach and pine, 3.5% for coconut pollen) (Towill 1985). Pollen can be successfully dried in 35°C ovens, but care must be taken not to over dry under these conditions (Yates et al. 1991). Rapid air-drying can also be achieved by using specialized pollen-dryers that blow air at 20% to 40% RH and 20°C, to quickly reduce moisture content in the pollen of Poaceae species, including Avena, Pennisetum, Saccharum, Secale, Triticum, Tricosecale and Zea (Barnabás and Kovacs 1996). Maize pollen is easily stored when quickly dried to 0.19 g H2O g-1 DW (Buitink et al. 1996).The longevity of the pollen from these desiccation-sensitive species, and its tolerance to freezing temperatures, has been extended as a result of using rapid dehydration methods. The principle of rapid drying (flash drying) has successfully been documented in recalcitrant seeds, where it was shown that one could dry to a much lower water content if one did it rapidly (Pammenter et al. 1991). It is possible to store pollen of many species at temperatures between 4°C and –20°C for the short-term. Dry pollen that is kept at between 4°C and –20°C remains viable for a few days to a year, which may be adequate for use in breeding programs (Hanna and Towill 1995). Long-term viability can be maintained by storing pollen at –80°C or LN temperatures (–196°C) (Hanna and Towill 1995). Once desiccated, pollen can be dispensed into cryovials for long-term storage in LN or LN vapour. Precise labelling of vials and storage locations is recommended to aid in future retrieval of samples. 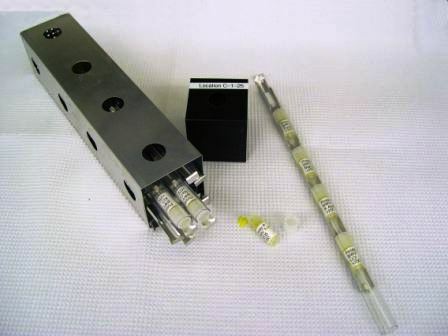 Vials can then be placed in boxes or cryocanes and directly immersed in the liquid or vapour phase of liquid nitrogen (Barnabás and Kovács 1996; Ganeshan et al. 2008; Hanna and Towill 1995; Connor and Towill 1993). 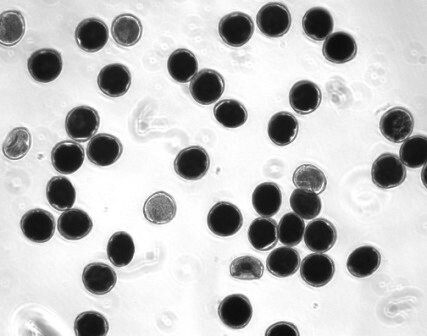 Dried pollen is susceptible to injury from rapid water update during rehydration (also known as imbibitional injury) (Hoekstra and Van der Wal 1988), which can severely reduce germination and lead to low viability counts if vital staining (stains to identify living cells) is used to assess it. Low temperatures can exacerbate imbibitional damage, which is believed to arise from mechanical damage to the plasma lemma as polar lipids undergo phase changes as a result of fluctuations in temperature, water content and sugars (Hoekstra et al. 1992; Hoekstra and Van der Wal 1988; Crowe et al. 1989). Slow rehydration ameliorates imbibitional damage to pollen grains and this is usually accomplished by placing the pollen in a humid environment prior to direct liquid exposure (Hoekstra and Van der Wal 1988; Luza and Polito 1987; Parton et al. 2002). Pollen rehydration can be as straightforward as placing open vials of pollen in 100% humidity environments for 1 to 4 hours at room temperature (Connor and Towill 1993; Hanna and Towill 1995). Although suboptimal storage conditions may affect pollen vigour before a measurable change in pollen viability is observed, most studies make use of viability assessments (Shivanna et al. 1991). Pollen viability can be measured by vital staining pollen grains, by germinating pollen grains in vitro, or by demonstrating successful fertilization and seed development in plants. Viability staining (thiazolyl blue tetrazolium) for pecan pollen grains (photo: John Waddell, USDA-ARS-National Center for Genetic Resources Preservation). One commonly used vital stain is the fluoregenic ester, fluorescein diacetate (FDA). This test measures membrane integrity. Pollen grains fluoresce green when a cellular esterase cleaves the FDA (Heslop-Harrison and Heslop-Harrison 1970). Since this assay is dependent upon functional membranes, the osmoticum of the FDA staining solution is critical; stain is often dissolved in a 10% to 20% sucrose solution containing boric acid and calcium nitrate to minimize plasmolysis and membrane leakage. Comparisons of viability determined through the use of FDA or tetrazolium and those obtained using in vitro germination or in vivo fertilization tests reveal consistently high correlations, provided pollen is adequately rehydrated prior to testing (Firmage and Dafni 2001; Khatun and Flowers 1995; Rodriguez-Riano and Dafni 2000; Shivanna and Heslop-Harrison 1981). FDA has occasionally been shown to give false negative results, where viable pollen appears dead (Heslop-Harrison et al. 1984). Several tetrazolium-based stains are available for testing pollen viability (Norton 1966). The 3 (4,5-dimethyl thiazolyl 1-2) 2,5-diphenyl tetrazolium bromide (MTT) test was shown to give the most dependable results in a comparison trial using plum pollen (Norton 1966). In general, tetrazolium tests measure the ability to reduce colourless tetrazolium to coloured formazan, thus identifying pollen that has a capacity for oxidative metabolism (Hauser and Morrison 1964). Many other vital stains have been developed and proposed over the past 50 years. Stains such as Alexander‟s, acetocarmine, aniline blue and X-gal have been shown to be successful identifiers of viability for relatively few species or under specialized conditions (Rodriguez-Riano and Dafni 2000). Viability results obtained with these stains may not correlate well with in vitro germination assays (Towill 1985). Pollen can be germinated in vitro by placing pollen grains onto a medium and measuring the elongation of the pollen tube after a few hours of imbibition. Pollen tubes that elongate to a length that is at least the diameter of the pollen grain are considered viable (Dafni and Firmage 2000). Automated counting procedures using morphometry software result in pollen counts that are within 5% of visual observations and allow the determination of pollen tube length in addition to the data obtained by eye on tube presence or absence (Pline et al. 2002). These automated systems may expedite time-consuming assays of in vitro pollen germination. As for viability testing, it is important to implement repeatable and standardized methods and to use dead pollen samples as controls. The optimal temperature for in vitro germination assays can be species dependent. The pollen from many species germinates well at 25°C; however, differences exist. For example, cotton pollen has an optimum germination temperature of 28°C to 31°C (Burke et al. 2004). Hence, for the purpose of pollen conservation, such information should be known for the target species. In vitro germination methods utilize pollen immersed in aerated solutions, “hanging” drops, or dispersed on solidified medium. The medium is often that described by Brewbacker and Kwack (1963) or a slight modification thereof. Boric acid, calcium nitrate and sucrose concentrations in the medium might have to be optimized according to species (Bolat and Pirlak 1999; Heslop-Harrison 1992). 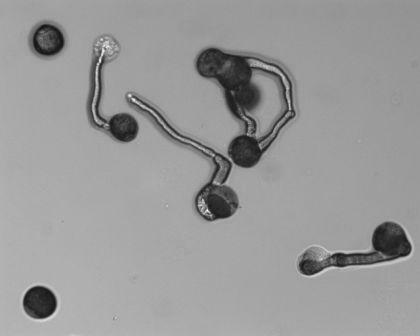 The hanging-drop method involves the placement of a slide or coverslip with liquid medium and pollen inverted over a 100% humidity chamber (Rajasekharan and Ganeshan 1994). For observation, the slide is returned to an upright position and observed under a microscope. Testing viability by observing pollen tube elongation within the stigma or fertilization and subsequent seed production is the most time-intensive way to determine pollen viability; however, these kinds of tests are also the most relevant to demonstrate the adequacy of the pollen for use. Rehydrated pollen can be placed on the stigmas of live plants, and tube length is measured after a pre-determined time interval (Dafni and Firmage 2000). Ideally, successful fruit set and seed production occurs after pollination with conserved pollen. Marquard (1992) demonstrated that high levels of viability are not required. Fruit set occurred when stigmas were treated with only 5% viable pollen. When pollen appears viable based on germination tests, it is often also viable in fertilization assays. The longevity of pollen is dependent upon many factors specific to cultivars or species as well as handling procedures, as discussed here (Ganeshan and Alexander 1991; Hanna and Towill 1995). The presence of sucrose and polysaccharides in the pollen has been correlated with protection of membranes from desiccation or temperature stress and may confer greater longevity (Dafni and Firmage 2000; Hoekstra et al. 1989). High-quality pollen dehydrated to an optimal moisture content and stored at LN temperatures has been documented to store for well over 10 years (Panella et al. 2009; Sparks and Yates 2002). The low temperature reduces the molecular mobility in the cytoplasm, which may be a controlling factor in pollen longevity (Buitink et al. 2000). The aging of dried pollen is likely caused by oxidative reactions, and pollens with higher levels of unsaturated fatty acids usually have a shorter shelf life (Hoekstra 2005). Correspondingly, pollen longevity may be further improved by storing desiccated pollen in an oxygen-free atmosphere (Hoekstra 1992). Most reports describing pollen survival after LN exposure state viability levels after determined lengths of time, often without initial germination data. These end-point levels serve to demonstrate that the tested length of storage is possible, but they do not describe the longevity of the pollen per se. Table 25.1 demonstrates the diverse range of species for which pollen can be placed at LN temperatures. According to current information, it is clear that both desiccation-tolerant and non-desiccation-tolerant pollen types can be stored for over 10 years under controlled conditions (Barnabás1994; Barnabás and Kovács 1996; Shivanna 2003). Thus, despite additional challenges that may be present in storing desiccation-sensitive pollen, it is possible. Additional research is needed to determine how long both types of pollen will remain viable under these conditions. Technologies for successful pollen conservation have been developed and are available. A set of standardized methods to process pollen types with different physiologies is needed to make pollen storage a routine effort in genebanks. For many species in need of pollen conservation, we need to know more about the phenology of pollen production so that we can properly time pollen harvests. Standards should be developed for pollen collection, processing and storage of desiccation-tolerant and non-desiccation-tolerant pollen types. Determination of pollen genebanking standards is an initial step towards implementing pollen genebanking methods. The literature currently lists the age and viability of pollen from many species stored at LN temperatures (table 25.1) (Barnabás and Kovács 1996; Ganeshan and Rajashekaran 2000; Hanna and Towill 1995; Towill 1985). However, the viability over time, or longevity, of pollen stored under LN genebanking conditions has not been thoroughly evaluated. In addition, detailed biophysical studies should be pursued to determine the optimal water content, desiccation rates and longevity relationships for various pollen types. Longevity must be known in order to ascertain the cost and benefits of genebanking pollen. There are abundant reports in the literature of many successes for testing pollen viability and temperature exposure. Many of the reported data and methods are difficult to replicate when basic parameters such as initial water content, equilibrated (desiccated) water content and rehydration methods are not described (Dafni and Firmage 2000). It is clear that the physiological state of the pollen at the time of collection and the handling of that pollen within the first few days after collection will determine its potential for long-term survival under optimum conditions. Detailed reporting of handling upon harvest is essential if standardized methods are to be developed. Confirmation that reported staining, in vitro germination and in vivo germination results are correlated increases confidence in and the repeatability of the reported data. Despite the challenges, pollen is a valuable genetic resource for conservation. It provides breeders and researchers with an additional, complementary, propagule that may be immediately useful in their programs, although the feasibility of pollen collection and preservation varies among plant species. Abreu I, Oliveira M. 2004. Fruit production in kiwifruit (Actinidia deliciosa) using preserved pollen. Australian Journal of Agricultural Research 55:565–569. Akihama T, Omura M. 1986. Preservation of fruit tree pollen. In: Bajaj YPS, editor. Biotechnology in Agriculture and Forestry. Vol. 1: Trees. Springer Verlag, Berlin. pp.101–112. Bajaj YPS. 1987. Cryopreservation of pollen and pollen embryos, and the establishment of pollen banks. International Review of Cytology 107:397–420. Barnabás B. 1994. Preservation of maize pollen. In: Bajaj YPS, editor. Biotechnology in Agriculture and Forestry. Vol. 25. Springer Verlag, Berlin. pp. 608–618. Barnabás B, Kovács G. 1996. Storage of pollen. In: Shivanna KR, Sawhney VK, editors. Pollen Biotechnology for Crop Production and Improvement. Cambridge University Press, Cambridge, UK. pp. 293–314. Barnabás B, Rajki E. 1976. Storage of maize (Zea mays L.) pollen at -196oC in liquid nitrogen. Euphytica 25:747–752. Bolat I, Pirlak L. 1999. An investigation on pollen viability, germination and tube growth in some stone fruits. Turkish Journal of Agriculture and Forestry 23:383–388. Brewbacker JL, Kwack BH. 1963. The essential role of calcium ion in pollen germination and pollen tube growth. American Journal of Botany 50:859. Buitink J, Leprince O, Hemminga MA, Hoekstra FA. 2000. The effects of moisture and temperature on the ageing kinetics of pollen: interpretation based on cytoplasmic mobility. Plant, Cell and Environment 23:967–974. Buitink J, Walters-Vertucci C, Hoekstra FA, Leprince O. 1996. Calorimetric properties of dehydrating pollen. Plant Physiology 111:235–242. Burke JJ, Velten J, Oliver MJ. 2004. In vitro analysis of cotton pollen germination. Agronomy Journal 96:359–368. Connor KF, Towill LE. 1993. Pollen-handling protocol and hydration/dehydration characteristics of pollen for application to long-term storage. Euphytica 68:77–84. Crowe JH, Crowe LM, Hoekstra FA, Wistrom CA. 1989. Effects of water on the stability of phospholipid biolayers: the problem of imbibition damage in dry organisms. Seed Moisture. CSSA Special Publication no 14:1–14. Dafni A, Firmage D. 2000. Pollen viability and longevity: practical, ecological and evolutionary implications. Plant Systematics and Evolution 222:113–132. Farmer RE, Barnett PE. 1974. Low-temperature storage of black walnut pollen. Cryobiology 11:366–367. Firmage DH, Dafni A. 2001. Field tests for pollen viability: a comparative approach. Acta Horticulturae 561:87–94. Ganeshan S. 1985. Cryogenic preservation of grape (Vitis vinifera L.) pollen. Vitis 24:169–173. Ganeshan S. 1986a. Cryogenic preservation of papaya pollen. Scientia Horticulturae 28:65–70. Ganeshan S. 1986b. Viability and fertilizing capacity of onion pollen (Allium cepa L.) stored in liquid nitrogen (–196°C). Tropical Agriculture (Trinidad) 63:46–48. Ganeshan S, Alexander MP. 1986. Effect of freeze-drying on pollen germination in vitro in papaya (Carica papaya L. cv. Washington) and tomato (Lycopersicon esculentum Mill. Cv. Arka Vikas). Gartenbauwissenschaft 51:17–20. Ganeshan S, Alexander MP. 1987. Storage and longevity of papaya (Carica papaya L. „Washington‟) pollen II. Effect of freeze-drying and storage at –20°C on pollen fertility. Gartenbauwissenschaft 52:207–209. Ganeshan S, Alexander MP. 1990. Fertilizing ability of cryopreserved grape (Vitis vinifera L.) pollen. Vitis 29:145–150. Ganeshan S, Alexander MP. 1991. Cryogenic preservation of lemon (Citrus limon Burm.) pollen. Gartenbauwissenschaft 56:228–230. Ganeshan S, Rajashekaran RK. 2000. Current status of pollen cryopreservation research: relevance to tropical horticulture. In: Engelmann F, Takagi H, editors. Cryopreservation of Tropical Plant Germplasm. IPGRI, Rome. pp. 360–365. Ganeshan S, Rajasekharan PE, Shashikumar S, Decruze, W. 2008. Cryopreservation of pollen In: Reed BM, editor. Plant Cryopreservation: A Practical Guide. Springer, New York. pp. 443–464. Hanna WW, Towill LE. 1995. Long-term pollen storage. Plant Breeding Reviews 13:179–207. Haunold A, Stanwood PC. 1985. Long-term preservation of hop pollen in liquid nitrogen. Crop Science 25:194–196. Hauser EJP, Morrison JH. 1964. The cytochemical reduction of nitro blue tetrazolium as an index of pollen viability. American Journal of Botany 51:748–752. Hecker RJ, Stanwood PC, Soulis CA. 1986. Storage of sugarbeet pollen. Euphytica 35:777–783. Heslop-Harrison JS. 1992. Cytological techniques to assess pollen quality. In: Cresti M, Tiezzi A, editors. Sexual Plant Reproduction. Springer Verlag, Heidelberg. pp. 41–48. Heslop-Harrison J, Heslop-Harrison Y. 1970. Evaluation of pollen viability by enzymatically induced fluorescence: intracellular hydrolysis of fluorescein diacetate. Strain Technology. 45:115–120. Heslop-Harrison J, Heslop-Harrison Y, Shivanna KR. 1984. The evaluation of pollen quality, and a further appraisal of the fluorochromatic (FCR) test procedure. Theoretical and Applied Genetics 67:367–375. Hoekstra FA. 1986. Water content in relation to stress in pollen. In: Leopold AC, editor. Membranes, Metabolism and Dry Organisms. Cornell University Press, Ithaca, New York. pp. 102–122. Hoekstra FA. 1992. Stress effects on the male gametophyte. In: Cresti M, Tiezzi A, editors. Sexual Plant Reproduction. Springer Verlag Berlin. pp. 193–201. Hoekstra FA 1995. Collecting pollen for genetic resources conservation. In: Guarino L, Ramanatha Rao V, Reid R, editors. Collecting Plant Genetic Diversity: Technical Guidelines, CAB International, Wallingford, UK. pp. 527–550. Hoekstra FA. 2005. Differential longevities in desiccated anhydrobiotic plant systems. Integrated and Comparative Biology 45:725–733. Hoekstra FA, Van der Wal EG. 1988. Initial moisture content and temperature of imbibition determine extent of imbibitional injury in pollen. Journal of Plant Physiology 133:257–262. Hoekstra FA, Crowe LM, Crowe JH. 1989. Differential desiccation sensitivity of corn and Pennisetum pollen linked to their sucrose contents. Plant Cell and Environment 12:83–91. Hoekstra FA, Crowe JH, Crowe LM. 1992. Germination and ion leakage are linked with phase transitions of membrane lipids during imbibition of Typha latifolia L. pollen. Physiologia Plantarum 84:29–34. Hughes HG, Lee CW, Towill LE. 1991. Low-temperature preservation of Clianthus formosus pollen. HortScience 26:1411–1412. Karipidis C, Olympios C, Passam HC, Savvas D. 2007. Effect of moisture content of tomato pollen stored cryogenically on in vitro germination, fecundity and respiration during pollen tube growth. Journal of Horticultural Science & Biotechnology 82:29–31. Khatun S, Flowers TJ. 1995. The estimation of pollen viability in rice. Journal of Experimental Botany 46:151–154. Lockwood DR, Richards CM, Volk GM. 2006. Wild plant sampling strategies: the roles of ecology and evolution. Plant Breeding Reviews 29:285–313. Luza JG, Polito VS. 1987. Effects of desiccation and controlled rehydration on germination in vitro of pollen of walnut (Juglans spp.). Plant, Cell and Environment 10:487–492. Marquard RD. 1992. Fruit set of pecan requires a low percentage of live pollen in controlled pollination. HortScience 27:473. Martínez-Gómez P, Gradiel TM, Ortega E, Dicenta F. 2002. Low temperature storage of almond pollen. HortScience 37:691–692. Namkoong G. 1981. Methods of pollen sampling for gene conservation. In: Franklin EC, editor. Pollen Management Handbook. USDA Agriculture Handbook No. 587. USDA, Washington DC. pp.74–76. Ng NQ, Daniel IO. 2000. Storage of pollens for long-term conservation of yam genetic resources. In: Engelmann F, Takagi H, editors. Cryopreservation of Tropical Plant Germplasm. IPGRI, Rome. pp. 136–139. Norton JD. 1966. Testing of plum pollen viability with tetrazolium salts. Proceedings of the American Society for Horticultural Science 89:132–134. Pammenter NW, Vertucci CW, Berjak P. 1991. Homeohydrous (recalcitrant) seeds: dehydration, the state of water and viability characteristics in Landolphia kirkii. Plant Physiology 96:1093–1098. Panella L, Wheeler L, McClintock ME. 2009. Long-term survival of cryopreserved sugarbeet pollen. Journal of Sugar Beet Research 46:1–9. Parfitt DE, Almehdi AA. 1983. Cryogenic storage of grape pollen. American Journal of Enology and Viticulture 34:227–228. Parfitt DE, Almehdi AA. 1984a. Cryogenic storage of olive pollen. Fruit Varieties Journal 38:14–16. Parfitt DE, Almehdi AA. 1984b. Liquid nitrogen storage of pollen from five cultivated Prunus species. HortScience 19:69–70. Parfitt DE, Ganeshan S. 1989. Comparison of proceduresfor estimating viability of Prunus pollen. HortScience 24:354–356. Parton E, Deroose R, De Proft MP. 1998. Cryostorage of Aechmea fasciata pollen. CryoLetters 19:355–360. Parton E, Vervaeke I, Delen R, Vandenbussche B, Deroose R, De Proft M. 2002. Viability and storage of bromeliad pollen. Euphytica 125:155–161. Perveen A, Khan SA. 2008. Maintenance of pollen germination capacity of Malus pumila L. (Rosaceae). Pakistan Journal of Botany 40:963–966. Pline WA, Edmisten KL, Oliver T, Wilcut JW, Wells R, Allen NS. 2002. Use of digital image analysis, viability stains, and germination assays to estimate conventional and glyphosate-resistant cotton pollen viability. Crop Science 42:2193–2200. Priestley DA. 1986. Seed aging: implications for storage and persistence in the soil. Comstock Associates, Ithaca, New York. pp. 1–304. Rajasekharan PE, Ganeshan S. 1994. Freeze preservation of rose pollen in liquid nitrogen: feasibility, viability and fertility status after long-term storage. Journal of Horticultural Science 69:565–569. Rajasekharan PE, Rao TM, Janakiram T, Ganeshan S. 1994. Freeze preservation of gladiolus pollen. Euphytica 80:105–109. Rodriguez-Riano T, Dafni A. 2000. A new procedure to assess pollen viability. Sexual Plant Reproduction 12:241–244. Sacks EJ, St. Clair DA. 1996. Cryogenic storage of tomato pollen: effect on fecundity. HortScience 31:447–448. Sato S, Katoh N, Iwai S, Hagimori M. 1998. Establishment of reliable methods of in vitro pollen germination and pollen preservation of Brassica rapa (syn. B. campestris). Euphytica 103:29–33. Schoenike RE, Bey CF. 1981. Conserving genes through pollen storage. In: Franklin EC, editor. Pollen Management Handbook. USDA Agriculture Handbook No. 587. USDA, Washington DC. pp.72–73. Sedgley M. 1981. Storage of avocado pollen. Euphytica 30:595–599. Shivanna KR. 2003. Pollen Biology and Biotechnology. Science Publishers, Enfield, New Hampshire. pp. 204–210. Shivanna KR, Heslop-Harrison J. 1981. Membrane state and pollen viability. Annals of Botany 47:759–770. Shivanna KR, Linskens HF, Cresti M. 1991. Pollen viability and pollen vigor. Theoretical and Applied Genetics 81:38–42. Sparks D, Yates IE. 2002. Pecan pollen stored over a decade retains viability. HortScience 37:176–177. Tandon R, Chaudhury R, Shivanna KR. 2007. Cryopreservation of oil palm pollen. Current Science 92:182–183. Tisserat B, Ulrich JM, Finkle BJ. 1983. Survival of phoenix pollen grains under cryogenic conditions. Crop Science 23:254–256. Towill LE. 1981. Liquid nitrogen preservation of pollen from tuber-bearing Solanum species. HortScience 16:177–179. Towill LE. 1985. Low temperature and freeze-/vacuum-drying preservation of pollen. In: Kartha KK, editor. Cryopreservation of Plant Cells and Organs. CRC Press, Boca Raton, Florida. pp. 171–198. Towill LE. 2004. Pollen storage as a conservation tool. In: Guerrant EO, Havens K, Maunder M, editors. Ex Situ Plant Conservation: Supporting Species Survival in the Wild. Island Press, Washington DC. pp.180–188. Tyagi RK, Hymowitz T. 2003. Pollen from Glycine species survive cryogenic exposure. CryoLetters 24:119–124. Van Bilsen DGJL, Hoekstra FA, Crowe LM, Crowe JH. 1994. Altered phase behaviour in membranes of aging dry pollen may cause imbibitional leakage. Plant Physiology 104:1193–1199. Van der Walt ID, Littlejohn GM. 1996. Storage and viability testing of Protea pollen. Journal of the American Society for Horticultural Science 121:804–809. Yates IE, Sparks D. 1990. Three-year-old pecan pollen retains fertility. Journal of the American Society for Horticultural Science 115:359–363. Yates IE, Sparks D, Connor K, Towill L. 1991. Reducing pollen moisture simplifies long-term storage of pecan pollen. Journal of the American Society for Horticultural Science 116:430–434. Zhang LX, Chang WC, Wei YJ, Liu L, Wang YP. 1993. Cryopreservation of ginseng pollen. HortScience 28:742–743.